The Lakers retired both of Kobe Bryant's jerseys. One wasn't enough. It's fitting because nothing was ever enough for him. The Lakers are going to retire both of Kobe Bryant’s numbers, according to ESPN, and the outrage is that they are stopping there. Along with 8 and 24, the Lakers should retire 81, 60 and 5 for him, then hang all the numbers on one side of the arena, away from the others, and find some way to get the numbers to challenge all the other Lakers’ retired numbers to a pickup game. Retiring two numbers for one man is utterly ridiculous until you consider the man. This is Kobe Bryant, unapologetic gunner, proud alpha male, self-proclaimed Black Mamba. You can now capture up his entire Hall of Fame career in one sentence: The Lakers retired two numbers for him. One was not enough. Of course it wasn’t. The whole point of Kobe’s career was that nothing was ever enough for him. Championships were not enough. Scoring titles were not enough. Fame was not enough. Sometimes he played like he wanted to dribble through a triple team and dunk over an advanced-stats gee. Kobe Bryant always wanted to drain a step-back three when his team only needed two, and he was so damn good at it that it was hard to argue. It was awe-inspiring. It was excessive. It was beautiful. Asking why he took some of those shots was like asking why Beyonce needs to dance when she sings. And, you know: this approach helped the man win five championships and play in seven NBA Finals. So I think it worked out OK for everybody involved. Kobe will have twice as many retired numbers in the Staples Centers rafters as Shaquille O’Neal. I know they’re all buddy-buddy now, but if Kobe doesn’t remind Shaq of this on a daily basis, I will be extremely disappointed. I hope the Lakers add a statue outside, stealing the ball from the Shaq statue. I’m sure there are people who complain this is a silly monument to the man’s ego. These, I presume, are the same people who complained when Bryant fired up 50 shots and scored 60 points in his final game, somehow damaging the “integrity” of the last regular-season game between two teams that would miss the playoffs. Look: I, too, spent many nights lying awake after Bryant’s final game, wondering how many Marcelo Huertas shots we missed out on because Kobe was busy giving people the sports thrill of a lifetime. But I’m over it now. Bryant was not the best player of this generation; that was LeBron James, no matter what Michael Jordan says. You can argue that Tim Duncan also had a superior career. But the NBA is appealing for two fundamental reasons: the artistry of the game itself, and the personalities of its stars. 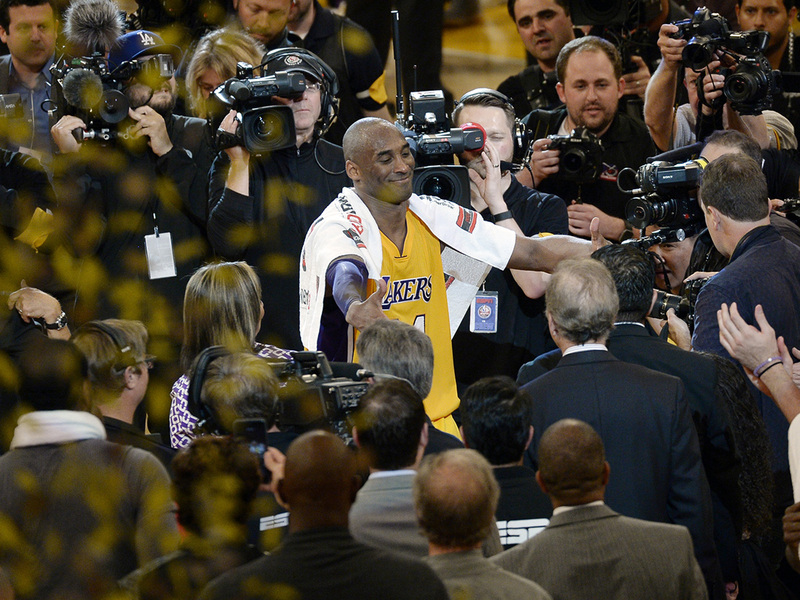 Nobody of this generation epitomized both like Kobe Bryant. Like a lot of basketball fans, I suppose, my feelings about Kobe evolved over the years. At first I was enamored of his talent—he was one of the rare Next Jordans who actually played like Jordan, even when he was a teenager. I’m not saying he was quite as good as Jordan. But you didn’t have to close your eyes and ingest heavy pharmaceuticals to make the comparison. He seemed to relish the comparison. Remember: when Bryant switched from 8 to 24 mid-career, his own coach, Phil Jackson, pointed out that Bryant was always trying to one-up Jordan, who famously wore No. 23. But when Bryant feuded with Shaq during the Lakers’ championship runs, the old-school hoops fan in me bristled. He’s the only guy in the league who doesn‘t want to play with Shaq! But then … well, then appreciation took over. Nobody worked harder. Nobody was mentally tougher. One of his chief complaints about Shaq seemed to be about the big guy’s work ethic. Bryant’s game—like Russell Westbrook’s game or James’s game—was an extension of his personality. And in an era where so many players want to join forces with their pals to win a championship, Bryant was a force unto himself. He was part basketball player and part superhero. It was a hell of a show. The Lakers are a superhero franchise. Magic. The Big Dipper. Mr. Clutch. The Black Mamba. This is why they paid Bryant $48.5 million for the final two years of his contract. He was the show, and they knew it. No, it didn’t make competitive sense. But even that was overblown, just as the stories about Kobe scaring off other superstars were overblown. The Lakers were going to have to rebuild no matter what happened. Now they have hired Bryant’s old agent, Rob Pelinka, to do the rebuilding. And now they will retire both of Bryant’s numbers. Perfect. I hope he gives two speeches.